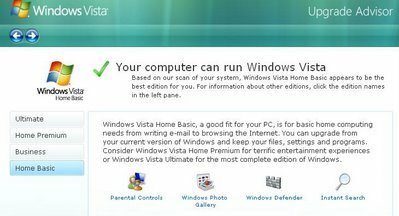 With Windows Vista launching today, you might be considering upgrading your computer to the latest Microsoft OS. Before you decide to part with anywhere from $99 (for an upgrade to Vista Home Basic) to $399 (for the behemoth Vista Ultimate), you might want to take a look at the free Vista Transformation Pack. It emulates many of the cosmetic changes that Vista comes with so if you're only concerned about your computer's looks, it's a good alternative. Vista itself doesn't come with too many new must-have features so if you can afford to wait, you might want to. If you decide to upgrade anyway, you will want to install the Windows Vista Upgrade Advisor, which will tell you whether your computer is Vista-ready.